Last week the food blogging sphere was full of blueberry sour cream ice cream and that got me craving some blueberry ice cream. Luckily the farmers market was still full of blueberries on the weekend I picked some up. Although I wanted to try a sour cream ice cream, frozen yogurt was calling my name. I could not resist pairing the blueberries with maple syrup and I used some to replace a bit of the sugar. Frozen yogurt can be a little tart so you have to use more sweetener than with normal ice cream. It is a good idea to add the sugar a bit at a time and taste test until you get it to the desired sweetness. Since I already had blueberries and maple I decided to add the third part of my current favorite trio of flavours, some toasted pecans. The blueberry, maple and pecan frozen yogurt turned out really well. The blueberry flavour was nice and strong there was a nice hint of maple. I really enjoyed the texture of the frozen yogurt and the toasted pecans added a nice contrast. Of course you have to melt all of the frozen yogurt in your mouth to find all of the pecan bits so you get to enjoy it longer. Heat the blueberries, sugar and maple syrup and stir until the sugar has dissolved. Let cool then mix in the yogurt along with the pecans and test for sweetness. I have my ice cream maker chilling and love the thought of Frozen yogurt. Good one Kevin, the colors are so vibrant. The color is out of this world awesome. I’m soo drooling. I’m totally obsessed with fro yo since we got Pinkberry here in LA. This looks great! I love your icecream recipes made with yogurt! They’re so much healthier and satisfy that ice cream craving. Excellent recipe Kevin,sounds easy and great treat too.The colour is amazingly beautiful. OMG I think I love you! Yeah….you keep making me think I need to get an ice cream maker. Does anyone have an 8 quart size for jumbo families? I love blueberry foods, too; summer is such a great time for dessert! I like that you are using maply syrup in this frozen treat. I never had blueberry frozen yogurt before. I usually buy chocolate. If I had an ice cream maker I could try this treat at home. Kevin, the color on your frozen yogurt is so intense. It’s so eye-catching. What a beautiful dessert! that is a stunningly colored dessert. Whoa, that is a deeeeeply colored froyo you produced there. It’s so magical that you’ve achieved it without artificial or added coloring! Your ice cream looks particularly good! An interesting combo! Amazing color this frozen yogurt has. I also love the addition of maple syrup and pecans. Lovey! I wanted to make some of this too. The color is so awesome and blueberries are almost gone so I better get on it. Wonderful Kevin! Is there any left? Oh yummy! I would like to do this with peaches. This sounds so tasty! I think I’ll be picking up some blueberries at the market. Thanks! This dish of frozen yogurt looks absolutely delicious! Yum! That looks freaking wonderful! making my stomach growl! kevin, yum! i love frozen yogurt and homemade is just that much better. love the flavor combination here. Wonderful recipe Kevin! Fruit and nuts are allways great to mix and that color of the frozen yogurt makes it look delicious! I don’t make ice cream, but I LOVE blueberries. I’ll be right over! What a delicious frozen treat I love the addition of pecans. Incredible color! You just know that’s good for you too. Great photography, Kevin. I think I have some blueberries in the freezer. I can’t decide which one of your blueberry recipes that I want to try! I love frozen yogurt, my favorite “healthy” treat! Your photo is stunning! What a good choice for combinations. The color is so pretty too. I just love looking at it!! Nice! Those colors are just gorgeous! Frozen Yogurt! I love thus! 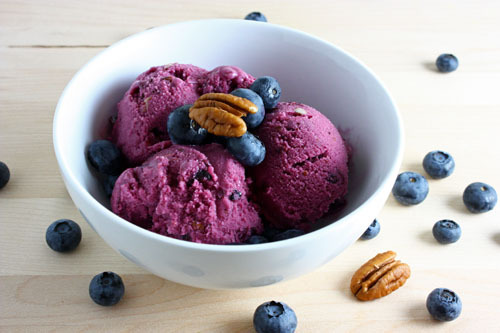 Awesome recipe, blueberry ice cream/frozen yogurt is incredible. I really wish I had an ice cream maker, I must get one when I move back east. Look at that beautiful colour. How could that not taste fab?! I can’t get over how gorgeous this ice cream is! Don’t you just love that gorgeous color? A very creative (and tasty) combination! The colour is just amazing. So vibrant! i loved the blueberry IC we made for TWD but this looks just as good! maple? mmmm! Was googling for a recipe to utilise my blueberries and found your awesome blog! I made this without ice cream maker and it taste great! Thanks for sharing this recipe.